Berkeley, CA: Kelsey Street Press, 2015. The recent memory of a white male poet who wore an Asian pen name gave new life to a tired discussion: (How) should poetry be read in relation to the poet’s identity? This particular white male poet stole an Asian name, ostensibly, to game the reading process. Nevermind the tacky, textbook case of confirmation bias — the premise is a familiar one nonetheless: whiteness and its nominal representations predicated as the default (and thus invisible, free) position from which poetry and art originate. Non-whiteness, by contrast, stands out as an indelible mark, an obstacle, attention-getting foil, to be transcended, excised, disappeared, as evident in the way the white poet shed his ethnic moniker after doing the deed. As when water finds its shortest path toward the ground, the English-speaking poetic tradition, too, self-regulates toward this prejudice. To renounce the name-stealing white poet would be to admit that his fake Asian name was more than marginal to the reading of a work, an act that is — has to be — somehow reproachable. This feels especially gut-punching for the Asian American poet who cannot drop and pick up names and identities. Even if we could — who among us is interested in merely overcoming rather than self-determining? In that vein, Nest and Strangers, out earlier this year from Kelsey Street Press, in conjunction with the press’s 40th anniversary, traces the work of Asian American women poets from 1970s onward. 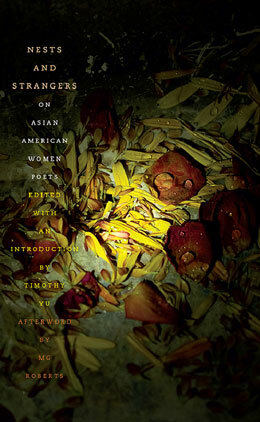 The anthology collects four critical essays on four prominent Asian American women poets, locating the poets squarely within their socio-politico-cultural identities, while emphasizing the disunifying ways by which their works attain literary prowess. The four poets discussed in this book — Myung Mi Kim, Nellie Wong, Mei-mei Berssenbrugge, and Bhanu Kapil — all deal with varying subject matters, write in disparate styles, and ultimately reject the kind of easy, fixed personhood prescribed by a reductive poetic tradition. Timothy Yu opens his introduction to the anthology by cautioning against the temptation to categorically reduce Asian American poets into only those “whose writing most frequently wore its politics on its sleeves” (3). The essays that follow not only challenge that assumption, they radically expand the scope of self-representation from the margins. Here the tide turns — identity markers shape-shift and resist mutual recognition; cultural loss and yearning find expression beyond discrete lyric affects; the disembodied self refuses to accrete even as its fragmented representations grow; innocent interlocutions amass into structural alienations. When the path to a “marked” poetics is revealed to be layered and many-forking, this multiplicity can be felt reverberating through the entire foundation of poetry. In her essay on Myung Mi Kim, Sarah Dowling juxtaposes Kim’s poetry against the modernist tradition of fragmentation. Unlike the modernist reconstituting impulse that collects in order to remake anew, Kim deploys fragments in order to sustain “an absent center” (11). It is the impulse to reduce or reconstitute marginal identity that must be overcome, not the marginal identity itself. And even when Kim’s work can sometimes be mapped onto a temporal plane, it is less concerned with becoming than it is with how one is “prevented from becoming” by the annihilating violences one faces. Kim writes, “Now tell me, who is the president of the United States? / You will all stand now. Raise your right hands.” A following stanza begins with: “Do they have trees in Korea? Do the children eat out of garbage / cans?” (14) Through documentary fragments, Kim expertly demonstrates the inherent contradiction between legal acceptance and social acceptance. One not only does not ensure the other, it often detracts from the other, the way intentional assimilation heightens awareness of differences. Mei-mei Berssenbrugge’s poetry, often framed within phenomenological terms, is given additional depth by Sueyeun Juliette Lee, who situates Berssenbrugge’s poetics within her larger involvement with Asian American community-building. Berssenbrugge’s poetics’ central characteristic is perhaps its long lines, often creating a visually lyric affect yet maintaining — unyielding — its paratactical composition. Identity, again, is not located in fixed objects, but emerges through shifting relations, some of which constitute “racializing processes” that cannot be easily categorized. In the book’s final essay, Dorothy Wang’s essay mirrors Bhanu Kapil’s destabilizing form. The subject is effervescent, often disappearing and reappearing. Kapil’s poetry crosses oceans, makes and unmakes the colonial subject, and is tinged with a nostalgia not for a time past, but toward a possibility of self-determination and self-knowing. In a clarifying moment, we are told that “[t]he route to semi-human (cyborgian) status necessitates the mastery of English; otherwise, one undoubtedly remains a monster” (86). Mg Roberts’ afterword recaps the need for a recursive and inclusive attitude when discussing Asian American poetry. She writes, “I am reminded of the ways in which the phoneme and the lyric are actualized through the page — an event much like chewing the cud, a recurrent conversation” (94). This anthology shows us a way out of the binary that forces a reader to either anticipate tawdry performances of identity on the page or to invisibilize it altogether. Rather, the web of shifting real-life relations, out of which poetic truth emerges, must not be flattened to fit a dominating mode of poetry-making. Consequently, the proverbial pure, untainted white poetic self, when juxtaposed against its imperialistic and colonial injuries, may then begin to address its own unmaking, as blood stains darkening a bandage. Grace Shuyi Liew’s poetry has been published in West Branch, cream city review, Twelfth House, Puerto del Sol, H_NGM_N, Bone Bouquet, PANK, and elsewhere. Her work dwells on the intersections of postcolonial feminism, sexuality, and language and poetics. Her first chapbook was published by Ahsahta Press in 2015. She is from Malaysia.